College Coach? Click here to view all of Landon's information. I am a current high school junior who has been very active in baseball and basketball since an early age. Competitive sports is a passion of mine, but academics, family and faith are the highest of my priorities. I love to win, but I love the process even more. The journey has been a blast so far, and I look forward for what’s yet to come. Tied for fourth in the velocity category of pitchers (83mph) out of 70 teams. Only 1 earned run all tournament. Work with Caleb McConnell, Eryk McConnell, and Mitch Whitner on individual pitching and hitting development. Strength and agility training. Both individual and group classes. 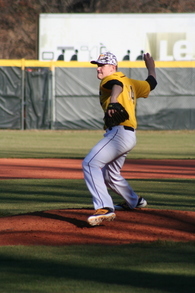 Tuscola High School Varsity as a Freshman. Starting Center. Top Freshman Center in the state of North Carolina (according to MaxPreps) in scoring, rebounds, and double-doubles.